I LOVE carrots!!!! I can remember back to being a kid and tasting my first carrot. No I don’t mean baby food in a jar or the kind you bought at the grocery store. I mean pulling the carrot from the garden, rinsing it with the hose and taking a bite. I had never really tasted a carrot until that moment and I will never forget it. The taste was amazing and totally filled my mouth and body with joy. My father was not very happy when I then set off to eat so many more from the garden. But oh what a joy to really taste food. If you are not growing carrots yourself, get some from the farmers market and ask when they harvested them. You’ll never want to go back to the grocery store again. Carrots get their orange color from the beta carotene (our bodies convert to Vitamin A) and is also rich in dietary fiber, antioxidants (help protect against certain types of cancer, heart disease and cataracts) and minerals. There are so many varieties and colors of carrots. Don’t limit yourself to the usual, especially if you live where you can get a variety. If not you might want to grow some of your own. 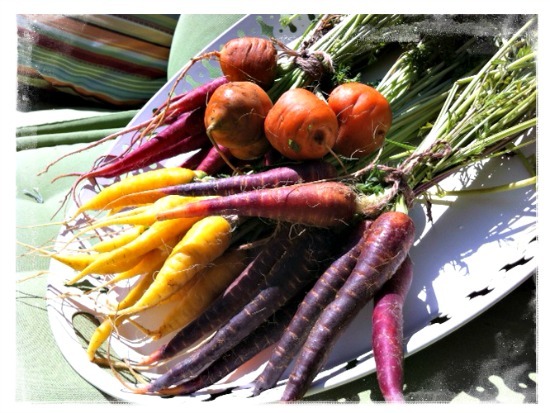 The Color Map: What do we know about the nutritional value of colored carrots? Xanthophylls, similar to beta-carotene, give yellow carrots their golden colors; they are linked to eye health and may reduce the incidence of lung and other cancers. Anthocyanins and pigments of the flavonoid (as opposed to carotenoid) class are found in purple carrots. In the human body these pigments act as powerful antioxidants, immobilizing harmful free radicals. Anthocyanins can also help reduce the risk of heart disease by slowing blood clotting. 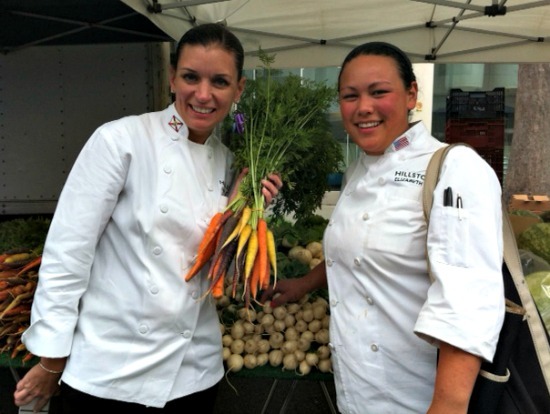 White carrots lack pigment but may contain other beneficial phytochemicals. More research is needed. Lutein is one of the hydroxy carotenoids found in yellow and orange carrots and makes up the macular pigment of human retinas. Consuming foods high in lutein may increase the density of this pigment and decrease the risk for developing macular degeneration and other age-related diseases. Look for firm bright orange carrots without deep splits or cracks. The deeper the orange color the more beta carotene is present. Think the same way when purchasing purple, yellow or red carrots. Also the leafy tops should be bright green. If you’re lucky enough to buy carrots with the leafy greens trim those down to one inch right away, otherwise the carrots will go limp and lose their nutrients more quickly. Toss those greens, yes they are edible, into salads and look like you’re eating at a gourmet restaurant. Since you want all of that great beta-carotene keep in mind it’s fat soluble so cook carrots with a some healthy fat or toss them into a salad with a little olive oil. I of course love my carrots run through my juicer. Just eat a little fat with that juice and you’re good to go. Also juicing carrots with oranges is a great way to sneak in some vegetables if you need to do that. Just in case you didn’t know, those little baby carrots, their own variety, are bathed in chlorine and water bath. Do you really want to eat that? I do have to say I loved all of last week’s recipes so if you missed them go back and check that out too. 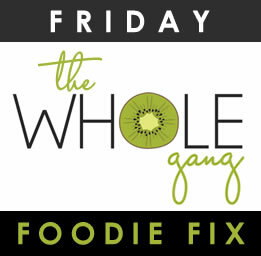 Next Week’s Secret Ingredient for Friday Foodie Fix is … Basil! Now it’s your turn to share your gluten free recipes with carrots below. 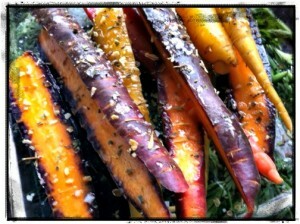 Okay, I think I've shared all the recipes where carrots play a starring role, or at least my favorite ones anyway! 😉 Carrots go into so many of my recipes … savory and sweet. Like you, Diane, I just love them. You have such great info on the bennies of carrots and beautiful photos … what fun to catch the chefs buying their carrots! thanks so much for hosting! this week, i shared my Carrot Cake Pancakes! They're Gluten Free, Vegan, Body Ecology Diet and Specific Carb Diet (SCD) friendly! have a great weekend! Thanks for hosting! I've loving the recipes. Caralyn's Carrot Cake Pancakes are certainly appealing!